Paolo Schianchi is now considered by many to be one of the best Italian musicians of his generation. He plays all existing variations of the guitar. He is a musician, composer, researcher and inventor. He has more than one degree with honours and has received numerous national and international awards both as guitarist and composer, gaining experience with several of the world’s most renowned guitarists. He graduated with honours from the University of Modena and Reggio Emilia with his first degree and also a ten-year Diploma in guitar, to which he then added a second post-diploma Master with honours at Level II in Music and Guitar and a third Master in Instrumental Teaching. He has been a teacher on instrumental courses and experimental ones at various European schools and academies, such as the department of the Conservatorio Statale di Musica F. Venezze in Rovigo, and he has been invited to hold master classes at prestigious overseas universities and schools, like the Duke Ellington School Of The Arts in Washington D.C. He has dedicated himself full-time in the fields of teaching and concert performance, teaching in public and private schools, and performing at prestigious festivals in Italy and abroad both as a soloist and with various Italian and foreign line-ups. He has also made recordings as a solo artist and in collaboration with renowned professional artists, such as the Parisian band Five O’Clock Jazz Group, the Arturo Toscanini Orchestra, Parma’s Regio Theatre Orchestra, Alberto Radius (legendary Italian guitarist and arranger for Lucio Battisti), Bernardo Lanzetti (PFM), Jim Donovan (Rusted Root, Carlos Santana, Led Zeppelin, Sting), Bill Burke, Michele Pertusi, Alessandro Haber, Maddalena Crippa, Umberto Fabi, Adriana Asti, etc. He has been awarded first prize at several prestigious national and international competitions (Giovani Talenti, Rovere D'Oro, with 350 participants from all over the world, Ermo Colle) both as solo guitarist and composer. In 2006 he published a research thesis entitled “Santino Garsi da Parma – Un Musicista da riscoprire” (Santino Garsi da Parma - A Musician to be rediscovered). With this work, virtuosic and counterpoint compositions by this Parmesan Renaissance composer (which those in the musicological sphere believed were lost) are brought to light, recovered and restored for the first time in modern history. His solo concert, entitled Instrumental Metamorphosis, for which he worked on the music, script, direction, technical equipment, quadraphonic and hexaphonic spatialisation, has attracted the attention and critical acclaim of experts and enthusiasts the world over, and have brought thousands of online visits on the celebrated YouTube site, together with a unanimously enthusiastic response from both critics and the public, and the recognition of Peter Stein, one of the world’s leading theatre directors. 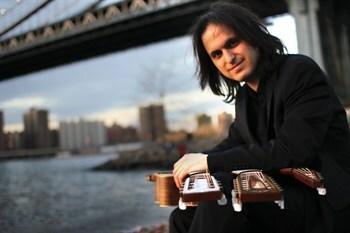 From 2003 to 2007 working alongside a number of Italian engineers and luthiers, he designed, created and lastly patented Octopus®, a complex electro-acoustic system that is currently unique worldwide, which he has recently performed with at several important concert venues including the Auditorium Parco della Musica in Rome. This instrument enables him to play several guitars contemporaneously using both hands and feet, mixing their sounds (with over 200 controls) in real time exclusively live and without the help of pre-recorded sounds. Paolo Schianchi was recently selected by a panel of television judges amidst thousands of contenders for the RAI New Talents Project (Progetto RAI Nuovi Talenti) and was presented live on national television on the RaiUno channel by Pippo Baudo, performing on live TV as a soloist and live yet again on several occasions on the two major television networks (RaiUno and RaiDue).